Potpourri Plus -- "Best of the Best"
Atlantis Casino and Hotel, the largest hotel property in the Bahamas, is a one-of-a-kind vacation destination. With unique attractions that evoke the lost world of Atlantis, the resort welcomes visitors into an entertaining land of fun and fantasy. The Legend of Atlantis: Mentioned in the works of Plato, Atlantis was a vast island empire that stretched, some say, all the way from the Mediterranean Sea to the Americas. In Atlantis, Poseidon, god of the oceans, allegedly ruled over a utopian society of harmony and abundance as far back as 10 centuries BC. According to legend, around 1,500 BC, the mighty Atlantis civilization was destroyed by a massive earthquake and it disappeared forever beneath the ocean named for it, the Atlantic. Ever since, romantics and scientists have searched for its traces but turned up empty-handed. Based on the legend of Atlantis, this resort creatively and playfully interprets this lost world, adding loads of luxe and gallons of glitz to the mythical history. The Lost City of Atlantis is closer than you think. And Atlantis is as close to paradise as you’ll ever get. There is no easy place to begin to explain this undescribable resort...it’s an adventure you will encounter that will never be forgotten. Hey, you might just make it a yearly trip. First of all, before you begin your journey, you need to check out their website. Your entire family will enjoy it and you can explore all of their wonderful sites and attractions before you even arrive...just in case you need a little more info to get you excited about going there. Before I begin my story, there are many people I would like to thank for making this trip so wonderful. First, and foremost, Angelo Hart...you made this trip truly unforgettable. Angelo is the Assistant Manager at the Discovery Channel Camp. He treated my children as if they were his own and, from the minute we all met him, we fell in love with him. He is kind, gentle and a true gem. I hope Atlantis realizes what a special person he is and how he fits the part perfectly. There is no better place for him to work than with children at the Atlantis Discovery Channel Camp. He also has a great team and each one of them is wonderful as well -- Valerie, the receptionist, Tamika, Leria M. and Candy B. You rock!!! And the Manager, Gia Deleveaux, is a sweetie as well. Next up: The Manager of the Royal Towers was always ready and willing to help us in any way. Raymond Bethell, we thank you. Miyashi Higgs of VIP Services in the Royal Towers was a joy to work with and very imformative. Lamont Hannah, our limo driver to and from the airport, was sweet and a terrific guide as well. My children enjoyed learning about the island on the way to the hotel. In the Royal Towers Concierge Lounge, there was always a helping hand. Keno Rolle, Tyrone Babbs, Carla McKintosh, Kim Symonette, Demetrius Taylor, Jamaine Moss and Winston Whylly (I hope I didn’t leave anyone out) -- you were all the best. Omar helped us out with snorkeling equipment (yes, Atlantis has it’s own little reef filled with fish as a feast for the eyes) and he’s a doll. And last, but not least, the manager of the Mandara Spa, Charmaine Burrows. You are very sweet and you have a great staff. There is no doubt that you run a first-class act. The Pedicure was the best, and most professional, I’ve ever had. My feet looked great for weeks with no touching up!!! When you arrive at the airport, it is a simple task to get a cab. Then, as you cross over the bridge that leads from Nassau onto Paradise Island and you see Atlantis for the first time, you will be in awe of its size because it is absolutely enormous! The Atlantis resort is so large that it warrants it’s very own map. When you arrive, you will want to pick up a map and a copy of the day’s itinerary (for feeding times of marine animals, movie times (yes, they have their own theater), kids activities and so much more. You will be amazed by the marine habitats found throughout the resort (Atlantis boasts as the largest marine habitat in the world, second only to Mother Nature). Not only will you find some of the largest fish tanks all around you, you will be able to view these sea animals from several under water viewing tanks, via your walks around the resort, and even from a rope suspension bridge. Or, you can eat your breakfast sitting in a room with walls of glass showing off some of the most magnificent marine habitat ever seen. Whether it is the sea turtles outside of the Beach Towers lobby, or the hammerhead shark right outside of the Royal Towers, you will find these marine habitats throughout the park. Hospitality Cavern in the Beach Towers is a facility used for guests who check in early or have already checked out but who want to take (or still take) advantage of the attractions. There is a Men's and Women’s locker room complete with showers, lockers, towels, hairdryers and more. To receive a key for your locker you need to check with guest’s services. The view from many rooms is awesome! Not only do some overlook the ocean, but some have an incredible view of the grounds of the Atlantis Resort (with views of the marine habitat full of fish and stingrays -- on some mornings you can watch as divers enter the water to clean the tanks and feed the fish/rays). We were lucky enough to have one of those rooms and at night we enjoyed just watching the huge Manta Ray swim around in the water with lights illuminating it as it gracefully flapped its wings). The rooms are incredibly clean (very important to most people) and the service is great. The Atlantis Resort offers more that just the standard guestrooms In fact, if you don’t mind spending $25,000 per night, you could have the most expensive room in the hotel including your own chef and personal staff (celebrities such as Michael Jordan and Michael Jackson have both stayed in this suite). Room options are: Executive Suites, Grand Suites, Imperial Club Executive & Grand Suites, and the Harborside Resort Villas (featuring one & two bedrooms). If you like having cocktails and horsdeuvres during the day and evening, you might enjoy staying in the Royal Towers on their concierge levels. There is also free internet access their and the lounge has a great view of the ocean and grounds. So, start with a living, million-gallon saltwater habitat (the world's largest outdoor, open water aquarium, complete with an underwater walk through a shark lagoon, giant sea turtles and thousands of tropical fish), and combine it with swimming pools, a magical tropical river ride, the Goombay Baths & Slides and miles of glorious sandy beach, add restaurants and Camp Atlantis (offering supervised children's activities throughout the day and evening), throw in a convenient assortment of restaurants, meal plans, nightlife and a casino, and what you have is Atlantis, Paradise Island, a resort experience that may redefine family vacations. The focal point of the 34-acre is the Atlantis Waterscape. There are six marine life exhibit lagoons including a Predator Lagoon with huge sharks, rays and barracuda, more than 40 waterfalls, five swimming pools, two underground grottos for underwater wildlife observation, an underwater clear pedestrian tube for up-close and personal views of sharks, a suspension bridge, and artificial coral reefs. Atlantis even has its own fish curator for the 35,000 pounds of tropical fish guests, representing more than 100 species. More than three million gallons of water are recycled four times a day to keep them all happy. Six full-time aquarium employees are also certified divers and are continually involved in catching marine life of all varieties for the resort's displays. If you love water (and you must or you probably wouldn’t have come to Atlantis), this is the place for you. There are a total of thirteen (13) pools and water recreation facilitates available for you at the Atlantis. Be prepared to wear your children, and yourself, out! Some of the fun spots to check out are: Lazy River Ride (located between the Beach Tower and The Coral Towers, the Lazy River Ride is just that, a lazy ride on an inner tube on a makeshift river and your family will probably never want to leave once they hop on. That is, of course, until you read further on); River Pool (located at the Beach Tower, this zero entry pool is quite large, and is connected to the Lazy River Ride - if you have smaller children who are not swimmers, this type of pool is the best! ); Poseidon’s Kid’s Pool & Play Area (located at the Beach Tower, this pool/play area offers a water fountain, animals for your children to climb and play on, and a slide that enters into a shallow pool - it’s perfect for your toddler); Lagoon Pool (located at the Coral Towers, this large pool offers a great view of the Predator Lagoon and a very tropical backdrop); Ripples Kid’s Pool & Slides (located at the Royal Towers, this pool features mini-water slides and water fountains). Here's one of the best places to go. Mayan Temple Pool & Water Slides: Located at the Royal Towers, this is where you will probably spend the majority of your time (along with everyone else). This pool is also a zero entry pool at the front. On the edges you have a stair entry, or … you could climb up the stairs near this pool and go down the mini water slides. And, if you want to relax in the hot tub, you can get there by either a small bridge, or by small water slides. This area is perfect with those who have older children who will be busy with the Mayan Temple waterslides and there are also Ping-Pong tables with paddles and balls provided. More water fun: Royal Baths Pool (Located directly in the center of the Royal Towers, what a view you have from this pool! You know that you are at a first rate hotel when you are sitting in the center of this pool. ); Goombay Water Slide & Baths (Located near the Coral Towers, very near to the entrance of the Lazy River, is a two part water slide. You go down one slide into a big “bath” area, and then continue down through a second slide, which lands you into another “bath” area. There are also a couple of “pools” located by this attraction. ); Cove Beach (This is a lovely place to lay in a beach chair (provided) near a gentler Atlantic Ocean. ); Paradise Beach (This is also another section of the beach with a good supply of beach chairs provided, and great beach activities for you take advantage of like parasailing and jet skis rentals. ); Paradise Lagoon (This 7 acre lagoon area is a great spot to take your kids! Not only can they snorkel, but you can take advantage of some water sports here too! Pedal a water bike out in this lagoon and have a blast); Atlantic Beach (Another section of great sandy beaches overlooking the Atlantic Ocean. ); West Beach (Another lovely beach.). The Atlantis Resort is the largest marine habit in the world, only second to Mother Nature. Having all these marine habits throughout the grounds truly enhances the beauty of this resort. You can spend hours, or even days, just walking around and around the resort in awe of these marine habitats. Outside of the Reef Wing of the Coral Towers you will find nurse sharks in lagoons located directly outside the guestrooms, and right off of the sidewalks. Yes, just walk right up to the edge of this lagoon and be so close to these amazing animals with no fences holding you back. Only a sign that mention these animals have very sharp teeth. (Your kids enjoy the sign.) Several of the Marine Life Exhibits and viewing locations found throughout the resort include (but are not limited to): Royal Stingray Lagoons (directly outside of the Royal Towers, this lagoon is packed with stingrays - not only can you view from a bridge above, but you can also get a close up view from the ground); Predator Falls & Rope Suspension Bridge(one of our favorite areas - you can see the two fascinating and mesmerizing hammerheads swimming about (it is truly amazing to watch them “in person,” five sawfish sharks, stingrays and other breeds of sharks as well); The Dig (a favorite of the entire family, this site is located in the Royal Towers -- it is absolutely fabulous and, if you are not a guest of this hotel, you will pay to view it - go on the tour or walk it at your own pace - The Dig is a a playful imagining of the ruins and remnants of the lost world of Atlantis and it consists of a series of mysterious interconnected passageways and chambers in a dedicated area of the resort - full-size picture windows open up to views of deep-water environments inhabited by a variety of underwater life ranging from pirahnas, a tank full of moray eels, “Nemo” fish, as my children call them, seahorses (amazing to see close up), lionfish, rockfish, several types of jellyfish and huge lobster tanks - there’s also an area where kids can touch conchs and other small creatures); Predator Lagoon, Reef & Underwater Viewing Tunnel (now you can go underneath the reef, which provides a whole new look at the awesome animals inside); Mayan Temple Predator Lagoon (located at the Royal Towers, this lagoon is packed full of some serious sharks that you can view above the water, from the ground, or directly inside if you are brave enough to ride the Serpent Slide). Additional areas include: a small habitat of baby hammerheads and stingrays, two areas with giant sea turtles swimming about, nurse shark habitats and lots more. We walked around for days just exploring new habitats (there’s something around every corner). Make sure to bring plenty of film with you, as you will want to capture everything! And if you forgot your film, don’t worry. Not only can you purchase film in one of the gift shops, but there is also photo processing done on grounds, complete with the option to purchase photos their staff members have taken. As far as restaurants/cafes go, there are many throughout the Atlantis that would work with most any pocketbook. You’ll find a dining guide in your room and on the very first page of this guide is the Atlantis Dining at a Glance. The name of the each restaurant is given, location, pricing guide, attire, and dining style for breakfast, lunch and dinner. This guide also included such information as outdoor dining, indoor dining, kid’s menu and bar/lounge/cocktails. This makes things simple. You will find that you have many choices to choose from, and that each restaurant has it’s own unique décor. Some of the 38 restaurants and lounges include: Seagrapes, The Cafe at the Great Hall of Waters, Marketplace, Water's Edge, Murray’s Deli, Villa D' Este, Bahamian Club, Fathoms, Atlas Bar & Grill and Mama Loo's. The Marketplace: This was our family’s favorite restaurant and we ate here at least four times during the week, for dinner. They were thrilled to choose ingredients for the stir-fry table (you could choose chicken, steak and shrimp along with onions, mushrooms, rice, peppers, etc.) and it was delicious. They had pastas, meats, great salads, an ice cream machine and, their favorite of all, a choccolate fountain. First chose fruit (strawberries, canteloupe, pineapple) or marshmallows and add them on a skewer. Put them under the chocolate fountain and voila, a fabulous dessert. Villa D’Este: Okay, I’m partial to Italian food but, even if I wasn’t, this is the BEST of the BEST in my book. From a Melon & Prosciutto Fresh Melon and Villa D’Este Salad (mesclun greens, pesto olive oil dressing with walnut-herb crusted goat cheese truffles) to the entrees of Chicken Portobello (nut crusted chicken breast stuffed with portobello mushrooms, mozzarella cheese, spinach gnocchi and balsamic drizzle) and Sea Bass Wrapped with Prosciutto or their delectable Spaghetti and Meatballs (who knew how good this could be -- we ate every drop, and there was quite a bit) to the wonderful desserts that included Tiramisu or Marsala Chocolate Mousse cake, we were satisfied every step of the way. And the romantic setting added to this fabulous meal (did I mention that the kids were in Camp Atlantis...just another bonus). Five Twins: Some of the food you’ll get to dine on includes an Oxtail Consomme (served with a crunchy blue cheese cigar), Crab Salad with Crispy Sesame Rounds, Bouquet of Baby Lettuce with Sweet Vegetables (Sherry Vinaigrette with Aged Balsamic), Dry Aged Striploin Steak (with crispy fried shallots, bordeaux sauce and country style sweet potato croquette) and Fillet of Wild Snapper (with purple potato and sweet corn and a tropical papaya coulis). And desserts are mouthwatering - they include: Vanilla Creme Brulee (served with a sweet and sour caramel sauce, tropical fruits and a cinnamon crisp), and Baked Belgian Chocolate Mousse (chocolate mousse spread thin and quickly baked into a delicate flourless cake, served with a caramelized mandarin orange compote). Mama Loo’s: Not your oridinary chinese restaurant. This is as good as it gets with dishes including: West-Lake Beef Egg Flower Soup, Honey-Garlic Chicken, Beef in Black Pepper Sauce, Wok-Fried Grouper Fish Fillet in Sweet Chili Sauce, Mandarin Orange Cake with Honey Orange Sauce, Cheesecake with Fruit Coulis or a great Combination Platter that includes chicken wings, fried spring rolls, steamed beef balls, pot stickers and golden batter fried shrimp. Fathoms: With so many fish, seafood and meat dishes to choose from, you can’t go wrong here. Feast with a Tropical Salad, Dungeness Crab Cake, Herb Seared Sea Bass, Escoveitch Red Snapper (local Bahamian Snapper with spicy cho-cho, carrots, onions and pepper strips simmered in allspice, peppercorns, goat pepper and white wine vinegar), Fire Roasted Chicken Breast, Lobster Tail & Beef Tenderloin, Coconut Tart, Margarita Key Lime Tart and more. Cave Grill: Located in the Beach Tower, right next to the beach and the River Pool, there is beach side seating, seating inside of a cave and many underwater viewing areas. In addition to burgers, hot dogs, and fries, they also feature salads, fajitas, chicken sandwich, onion rings, conch fritters and more -- and don’t forget the ice cream and non-alcoholic frozen drinks (your children will love these). Shark Bites Express: This is next to the Mayan Temple and Predator Lagoon. It is the perfect spot to have a quick something to eat before heading back to the pool. Featuring a very close menu as the Cave Grill, the children’s menu is perfect with very large portions. Plato’s: Don’t miss this place. Take advantage of the very inexpensive continental breakfast or sandwich/chips on the go. Located in the Royal Towers, this bar features both outdoor seating and indoor. While it is a bar (children were not allowed to eat there), there is an area located right next to it with big comfy couches and chairs. Water’s Edge: This restaurant is located on a lagoon featuring sharks and stingrays. It’s located via the Coral Towers and offers a hearty buffet in the morning and a vast array of food for a dinner buffet. The food is excellent and the service is exceptional. You can find fresh seafood, prime rib and steak, a pasta bar and pizza bar. Both adults and children will have fun here. And don’t forget to leave room for dessert (there are around twenty delectable items to choose from). For an incredible buffet, entertainment (a live band) and most importantly, great service, it is a treat that you well deserve. Shopping is available for every family member and every price range. There is something to be bought by all. Located throughout the Royal, Coral and Beach Towers (which is all connected via hallways) are the Atlantis Logo Stores (postcards, picture frames, t-shirts, handbags, playing cards (real cards once used in the casino for one one dollar), marine life stuffed animals, towels and much more. There are also shops like Gucci, Cartier, Bvlgari, Colombian Emeralds and Amici (just in case you hit it big in the casino). Don’t forget, all purchases are duty free. Mandara Spa At Atlantis. Originating in Bali, this spa brings to Atlantis unique treatments that reflect the beautiful traditions of exotic cultures found worldwide. Ancient techniques from Asia, traditional European spa therapies, and natural spices, fruits and minerals indigenous to the Bahamas meld together to provide the ultimate rejuvenating experience. Now it’s time to pamper yourself. 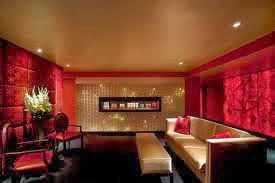 Their spa contains 24 treatment rooms that include: a sauna, steam rooms, two tropical rain showers, pedicure/manicure and hair stations, lounges, facial rooms, massage rooms and a boutique filled with spa and beauty products. We must thank Charmaine Burrows for her help and the wonderful Natasha for the awesome Deluxe Tropical Pedicure that included the delicious Ginger and Salt Scrub. You can begin your relaxation in the Utopian Water Rituals and let the heated saltwater pool, tropical rainshower, gentle sauna and aromatic steam room melt away tension. Enjoy a full complement of massage therapies, refreshing facials, exotic body scrubs, salon and beauty services, or a combination of treatments for the perfect spa day. Some things to try are: Swedish or Sports Massage, Elemis Japanese Silk Booster Facial, La Therapie Oxygen Lifting Facial, Caribbean Coffee Body Scrub (YUMMY - awaken your spirit with the intoxicating aroma and revitalizing effects of finely ground Caribbean coffee, vanilla and spice oil - this refreshing scrub will smooth and revitalize your skin and it comes complete with a 50-minute massage). Atlas’ Retreat (the Elemis Exotic Coconut Rub and Milk Ritual Wrap polishes your skin while the aroma and soothing milk bath indulges your senses - you’ll feel like you’re floating in the clouds while cocooned in the state-of-the-art hydra-envelopment bed - complete the indulgence with an aromatherapy massage). Some of the The Sports Center is a great place to work out and it is located behind the Royal Towers. Check out their fitness equipment, classes and personal training, 18-hole putting course, four-lane lap pool, volleyball court, tennis courts and full size basketball court. As you jog on the treadmill, your view is the grounds of the Atlantis and the Atlantic Ocean. Working out doesn’t get any better. As if there wasn’t enough to do already, you have more options. You can view the incredible yachts inside the Atlantis marina. At night there are plenty of additional options. The Joker’s Wild Comedy Club; the Dragons Nightclub (with some of the Bahamas most popular bands); and, our favorite, the Atlantis Casino (open 24 hours, the Casino at Atlantis Resort is the largest in the Caribbean - this Atlantis-themed space holds some 980 slot machines and 78 gaming tables including baccarat, roulette, craps, blackjack, and Caribbean stud poker - the Baccarat Lounge at Atlantis Casino Resort attracts the highest rollers - even if you don't drop a dime, it's still worth walking through Atlantis Casino to admire the dramatic glass sculptures by Dale Chihuly that evoke the mystery and history of the long-ago and faraway island called Atlantis); Club Rush (for teenage or pre-teenagers, this is a great place for your teenager to surf the net, play Playstation, dance to some of their favorite tunes and hang out with kids their own age); and Discovery Channel Camp (which needs it’s own review, below). Discovery Channel Camp. Thanks to a great staff and the man of all men, Angelo Hart, the best director around, my children had the trip of their dreams. They were treated with such kindness, love and respect, as if they were royalty. They literally cried each night when we went to pick them up and that was all we needed to feel that they were having the best time ever. They would have stayed in camp 24/7 if that option was available. This supervised children’s program provides an upbeat atmosphere with a comprehensive schedule of activities for ages 4 through 12. Atlantis and The Discovery Channel have teamed up to develop this exciting new program to provide a new level of educational entertainment. The world of family vacations is about to be changed. Swimming and searching for buried treasure, authentic Bahamian crafts, nature walks, first-run movies and cartoons, pirate stories and games are among the possibilities. Others include air hockey and Nintendo, Sega and other computer games, face painting, talent shows, sand castle building, and ice cream contests. The 3,000 square-foot Camp even has its own mascot, Chickcharnie, a traditional Bahamian bird. Camp Features: Exploration and History (adventure begins around an authentic replica of the Atocha, a famous Spanish galleon that sank in 1622 - both a play and orientation area, this base camp provides youngsters with an overview of the adventures awaiting them throughout the day -- storytelling will happen here); Technology Lab (state-of-the-art computers linked to the internet, image scanners and real video camcorders let kids make personalized movies, postcards and posters); Science Outpost (kids will be hands-on with working microscopes, magnifiers, dissecting bugs (my son loved this), live animal touch tanks, aquariums, and specimen collections of fossils, bones, animals and plants); Nature Crafts (children will have a chance to express their creativity with awesome activities including sand sculpting, wild artwork, puzzle making, and Bahamian crafts -- the gifts they will make you are better than any souvenir -- we loved the balloon people, styrofoam sailboats and beaded lizards); and Atlantis Exploration (outside, the world's largest marine habitat, second only to Mother Nature, beckons exploration - kids will go on expeditions to see over 40,000 marine animals, representing 150 species, from schools of giant sharks to sea turtles to tropical fish); the Marine Habitat Feedings were wonderful (our kids were chosen to feed the baby sharks and baby stingrays one day which was very exciting for all of us as we got to meet them there for videotaping). The kids really loved going to dinner with all of their new friends (at many of Atlantis’ great restaurants including Murray’s Deli) without mom and dad and each night they came back to the room with a wonderful treasure for mom and dad to take home (again, better than any souvenir). You can take a tour of the facilities prior to entering your child for camp and they will answer any questions or concerns you may have. And don’t forget to put some sun block on your child as they do go to the pool for games, swimming and more. It really was the best part of the trip. They thoroughly enjoyed themselves and my husband and I were able to spend some quiet, quality time together (we even slipped into the casino and had a romantic dinner at ). If you still haven’t had enough to keep you going, there are always activities outside of Atlantis to enjoy. Some activities are run through Atlantis. We took a snorkeling trip which was a lot of fun. It started off as a catamaran ride (fun all by itself), turned into a wonderful snorkeling trip and ended up with an informative and fun tour of part of the island (we saw Michael Jordan and Oprah’s new homes). Also, guests who care to have a swim-with-dolphins experience can find a facility where they can do so a short ferry ride away. That was a great time for all of us. We dare you to try Atlantis...just be prepared to have the time of your life and memories that you will never forget. And, most importantly, be prepared to come again and again because once you visit Atlantis, there’s not much better you can do for an awesome family trip. Enjoy Morning and afternoon snorkeling trips aboard one of their state-of-the-art sailing catamarans. This experience lasts 3 1/2 hours and takes you to one of the Bahamas most beautiful reefs. The adventure in the crystal clear turquoise waters of the Bahamas includes one Rum Punch, soft drink or bottled water, all snorkeling equipment, instructions, a cute tour, a wonderful boat ride and a day of fun. It departs at either 9:00 am or 1:00 pm. We had the pleasure of riding on the Seahorse II with Carlton B. Smith, Anthonio Cartwright and Makieshia who were the best tour guides around. Seahorse Sailing also offers Sunset Cruises (enjoy a Bahamanian sunset from the ocean in an intimate, relaxing setting for individuals or groups). And for corporate sailing adventures, weddings or special events, they offer a variety of themes, itineraries, and catering options. There are so many choices available and they’ll work together with you to make your sailing adventure the most memorable ever. Just bring along your towel, bathing suit and a big smile. 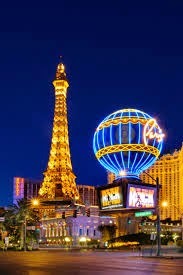 LAS VEGAS is a city full of excitement and loaded with so many places to see and experience. However, when you only have a few days to visit, it gets complicated as you try and decide on what to do with limited time. It's difficult choosing from hundreds of hotels, restaurants, and attractions, but we've gathered up a pretty good first-timer's list and hope you accept a few of our selections. As always, we couldn't feature everything we wanted to in complete detail, but this will give you a head start. 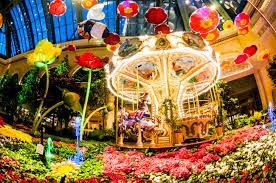 The epitome of luxury and excellence, Bellagio is a visual masterpiece. This hotel and casino is certainly at the top of their game. From the moment you pull in to their grand resort, you know it's something pretty special. As you enter, their front desk adorably awaits you. Behind the check-in desk is a beautiful garden, decorated with flowers and balloons to lift your spirits immediately. 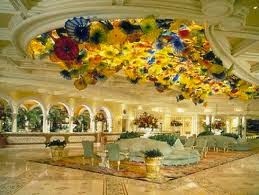 Fiori di Como, the hand-blown glass flower art sculpture, adorns the 18' high ceiling and was designed for Bellagio by famous artist Dan Chihuly. It's stunning, created with over 2,000 pieces intertwined with each other. 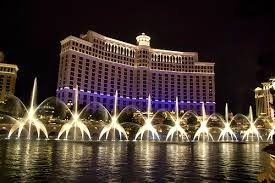 I would need pages to respectfully review the Bellagio, but I'm trimming it down to basics. The rooms are delightful (try to get a Fountain/Eiffel Tower view), shops are dangerously wonderful, grounds are stunning, casino is fantastic, restaurants are top notch, gym and pools are perfection. What more could you ask for? Nothing! The Bellagio Conservatory and Botanical Gardens are gorgeous. Their themed floral arrangements change with the seasons. Flowers are meticulously cared for by handfuls of horticulturists at their beck and call. We love the glass house filled with adorable, brightly-colored birds. You'll enjoy watching them dance and sing around their home sweet home. The infamous Fountain show did not disappoint. Awe-inspiring beauty. Water is the star of this free show (I would have paid to see it). Choreographed and timed to music, the fountain show is something you will never see anywhere else, and you will hear many oohs and ahhs emanating from the crowd. Standing on the hotel side of the lake, with the Eiffel Tower as a backdrop, was a spectacular spot. You can never get tired of watching it, and you don't have to because it plays continuously, at intervals, throughout the day. Relaxing by their pools is something I could have done for three straight days. Five pools spread out over their beautifully manicured gardens, offered something for everyone, adults and families. Chairs are comfy and nicely spread apart. Grab a quick bite, and/or a cocktail, and enjoy. Vegas can be tough, there's a lot to see and do, and it can be somewhat draining, but as soon as you lay down on one of their lounge chairs, all of your stress wanders away. 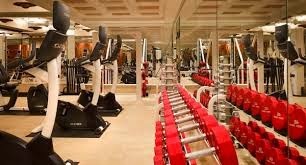 The gym was incomparable to any other hotel gym that we have utilized in the last twenty years. Most hotel gyms are disappointing, providing the bare minimum of space and equipment. 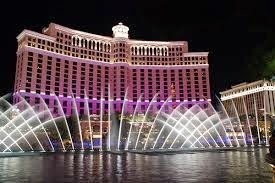 Not the Bellagio's. It was the kind of gym that you would be a member of, with everything you could want or need. Restaurants were excellent, with outstanding choices (see reviews below). 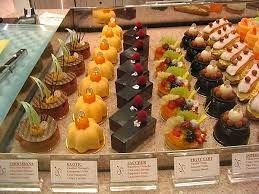 Jean Philippe's Patisserie has quick-bite delights (sandwiches, salads, desserts). The chocolate crepes are ridiculously delicious, as are many other delectable desserts. Meals are perfect, all tasty. 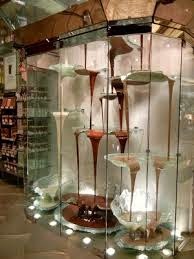 While you're waiting for your food, turn around and feast your eyes upon the world's largest chocolate fountain... 27' high with 2,100 pounds of chocolate that continuously recycle. A real Willy Wonka moment. Todd English's Olives (Bellagio). Our favorite restaurant on this visit, Olives didn't miss a trick. Seated on the patio, overlooking the fountains, the view couldn't have been any better. Everything, from the ambiance to the service to the food, was outstanding. Starting off with beef carpaccio (with cipollini onions, scallion cream, and gorgonzola polenta), the best we've had anywhere, the meal just got better and better. Flatbreads were crisp and flavorful with sweet, caramelized onions boosting their flavor up a notch. Their untraditional Caesar salad (with oven dried tomatoes and bacon marmalade crostini) was incredibly delicious, as was the uniquely wonderful Watermelon salad. Next up were the entrees... Linguini Alle Vongole (littleneck clams and white wine sauce), Sea Scallops (with truffle potato puree and sea beans in cabernet reduction), Beef Tenderloin (with tempura asparagus, caramelized onion potatoes in a red wine demi sauce), and Lamb Lollipops ... all mouthwatering. Desserts... loved the refreshing sorbets, and the decadent Chocolate Falling Cake. Dal Toro Restaurant (Palazzo). 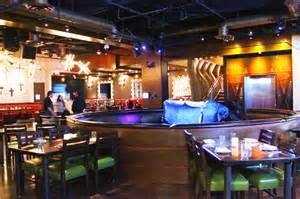 Whether you are looking for corporate event space, a family meal out, or a romantic dinner, this is the place for your. Loved this unique restaurant, and found it by accident. This wonderful Italian restaurant has fun and varied seating, whether you want to sit on their outdoor patio (right on the strip... great for people watching), or inside. Take a break from your meal and visit their exotic car collection downstairs... perfect for car enthusiasts. You will enjoy the ambiance and your meal. The service is extraordinary, waiters are attentive and on the ball at all times. The food was moderately priced, and the atmosphere was quiet and romantic. Some of their many offerings we tried were: Meatball appetizer (tasted hundreds of meatballs, and this one was above and beyond our expectations), Caesar salad (made just right, with perfect blend of ingredients), Calamari (crisp and light), Steak Al Pepe Verde (amazing combo of flavors, peppercorn brandy sauce, and so tender), Fettuccine Alla Bolognese (to die for), Shrimp Ravioli (mmmmm), Capellini Al Pomodoro (excellent homemade egg pasta choice), and Lasagna Della Nonna (baked pasta with layered sausage, meat ragu, hard boiled eggs, prosciutto cotton, fresh mozzarella). Desserts were really tasty... loved them all. Bellagio Buffet. There are dozens upon dozens of buffets in Las Vegas. And there are many top ten lists. 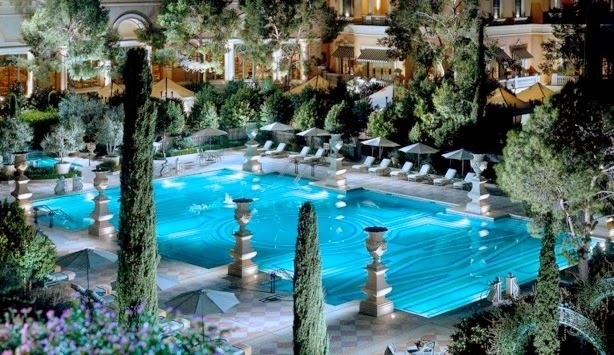 We gave the Bellagio's a shot just because everything else there was as good as it gets, and we weren't disappointed. The atmosphere was nice and the food great. 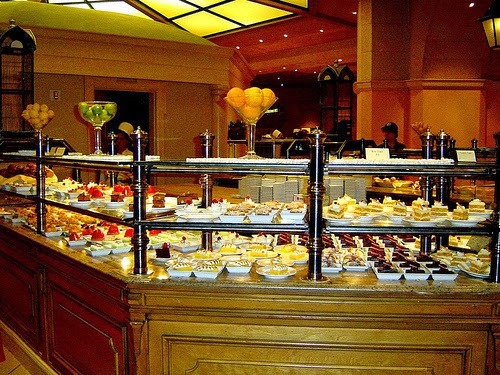 This gourmet buffet will leave you longing for absolutely nothing. Everything was fresh and they had all the usual dishes that you would expect... salad offerings, prime rib, roasted chicken, fruit, vegetables, meat and chicken dishes, and pizza. In addition to that, there was fresh sushi, king crab and snow crab legs, beef teriyaki and beef stew (both really excellent), beef tartar, Chilean sea bass, briskets, salmon, shrimp cocktail bar, Mexican, Italian, and Asian sections (all delish). As far as desserts, we loved the mini Key Lime pies, chocolate mousse, and the creme brûlée. Chayo (Caesar's Linq). This new Mexican restaurant will surely satisfy you. First of all, we enjoyed the Linq area, with lots of cute, unique shops, cafes and restaurants. Chayo is fun, beautifully decorated, tvs at the bar, unique artwork, and we love that they have a mechanical bull for their patrons to try out almost every evening. You don't see that around too often! Their food was gratifying... created with unique twists on traditional Mexican food. Everything we tried was excellent. First stop was some tequila and they have a collection that can't be beat! We continued with apps: Homemade chips and salsa (sprinkled with chile for a kick), trio of tacos (crispy shrimp, beef and chicken), Cilantro Soup (very different and delicous), and Queso Fundido. For dinner, the fajitas were phenomenal, steak cooked perfectly and accompanied by greaseless peppers, onions, prickly pear cactus (yes, you read correctly) and roasted corn. Fabulous. All of their steak dishes will melt in your mouth, they're that amazing. The Rib Eye tacos are filled with big chunks of tasty steak. The Lobster tacos are the best you'll ever try. The Avocado Corn Chopped Salad was so flavorful and full of different textures. And we enjoyed the Churros with chocolate sauce, a very different dessert. 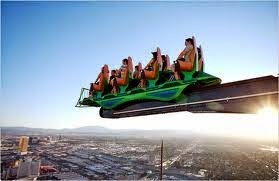 Stratosphere SkyJump. Going up the elevator to the roof top of this hotel (855 feet high up) is scary enough. Standing on a tiny ledge and jumping off is a whole other thing. 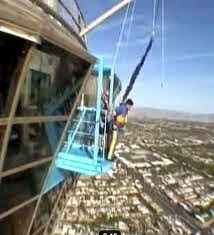 The SkyJump is one of the most exciting attractions in Vegas and it will test your every nerve. You are basically jumping off the top of the roof while attached to a bungee cord. It's terrifying and exhilarating at the same time. Although the rides doesn't last long, it will provide you with a 'bucket list' experience that you will be thrilled you conquered. Stratosphere Trio of Rides - Big Shot, Insanity, and X-Scream. Each cutting-edge ride is unique that you'll want to do all three. In addition to the rides, the views from the observation deck are priceless. The word insane (no wonder why one of the ride utilizes the word) comes to mind (in a good way). Start off and get your adrenaline pumping with Big Shot, a ride that shoots you up to the clouds (or it feels like you are). Then move on to Insanity, a 'rocket-shaped' car that shoots out and drops you 25 feet off the side of the building at different angles, 855 feet above the ground. It makes you feel like you're going to shoot across the building, and then abruptly stops. Save X-Scream for last (you need to slowly get your nerve up). This crazy ride has you seated in a claw-like machine. It swings you over the side of the building (as you are slanted somewhat facing down) and then spins around. Scary stuff. 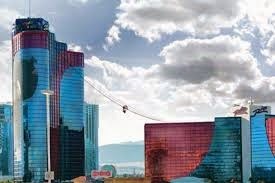 Rio Voodoo Zip Line. Not for the weak of heart, this attraction/ride is fun and exciting, and a little nerve-wracking, too. You take the elevator to the top of the Rio hotel (at 500 feet in the air) and zip down to one of their other buildings going 33 mph. The view is incredible, especially at night, and although it's a short ride, it's an experience you'll always remember. Going down is really fun, you almost feel like it's not going to stop at the building below. Going backwards is scarier because you can't see where you're going, but it's also a great part of the experience. Being so high up with nothing below your feet is pretty cool. We also liked the fact that the seat holds two people, so you don't have to do it alone if you don't want to. And when it's all over, take your time and enjoy the sights of the strip and mountains. Check it out! Venetian Gondola and Grand Canal Shoppes. First of all, the Venetian hotel is gorgeous. It's about as close a feeling of being in Italy as many of us will get. The Grand Canal Shoppes are beautiful, created with incredibly detailed architecture as if you were in the romantic city of Venice. You definitely will not feel as if you're in a shopping mall. With clouds painted on the ceiling, storefronts designed as the buildings you would really see in Venice, and entertainers prancing around at St. Mark's Square, it's pretty authentic. After you're done shopping, or grabbing a bite at one of their many food establishments, end your time there with one of their two precious gondola rides. 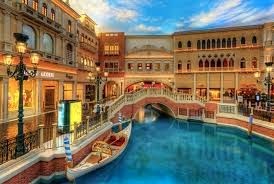 The indoor ride is at the Grand Canal Shoppes, and it will transport you to Italy on a one-of-a-kind experience as you float down the 1/4 mile-long Grand Canal in an Italian gondola. Float beneath bridges as your gondolier takes you for a ride, serenading you at the same time. The outdoor ride takes you on a romantic tour along the lagoon. It's breathtaking at night, with the beautiful lights of the city as your background. A nice, relaxing way to get away from the hustle and bustle of the city! New York New York Big Apple Roller Coaster. First of all, we love this hotel. It looks like Walt Disney had a hand in building the New York skyline's harbor view that makes up the front of the hotel. 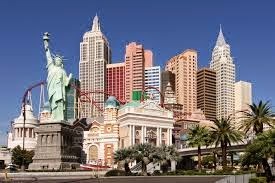 The 150-foot Statue of Liberty model, Empire State Building, and Chrysler Building are some of the buildings replicated. As far as the coaster goes, you start off in a 'taxicab' train. 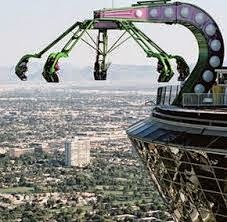 Then what awaits you are intense multiple loops, towering drops, a steep hill, an aerial view of the Strip, a short ride through the hotel, and a 144-foot drop. All while doing crazy loops, exhilarating corkscrews, gut-wrenching spirals, and going 67 miles per hour. Exciting New York is definitely being represented properly! 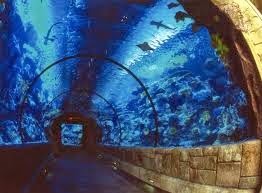 Mandalay Bay Shark Reef. Who doesn't love a good aquarium? This one won't disappoint... it's completely different than most we've seen and the exhibits are so beautiful, very artsy. This awesome attraction is a perfect place to take the entire family, as they go face-to-face with some of earth's most fascinating creatures. The collection of animals is remarkable. You'll see all kinds of sharks (especially loved the tunnel where the sharks and rays swim right above you), turtles, a komodo dragon, jellyfish, lion fish, piranhas, sawfish, a golden crocodile, and so much more. Their touch pool is great, for adults and children, as you can feed stingrays and horseshoe crabs, getting up close and personal with them. For an extra fee, you can even swim with the sharks (if you have a scuba diver's license). All in all, what a great way to spend a few hours of your day! Eiffel Tower Experience at Paris Hotel. This is a cool thing to do, especially if you time it with the Bellagio Fountain show or the Mirage Volcano show! Take a ride up to the top of the half-scale replica tower and get fantastic 360-degree views of the strip and its flood of neon lights. Enjoy a meal at the restaurant and stay as long as you want. If you have the time, order one of their chocolate souffles... it will be the best you've ever had. No need to go out of the country... you'll truly feel like you're in Paris. Las Vegas Monorail. 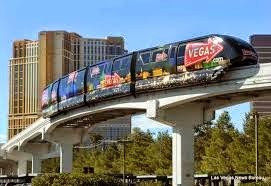 If you're tired of walking, which can be pretty fun for the first day or so as you explore the strip and all it has to see and offer, the monorail is the best way to quickly move from one end of the strip to the other. Seven stations are scattered up and down the strip, and your needs will be met quickly and efficiently. It's a well-oiled machine and even fun for the kids! Florida: Orlando and Sarasota/Siesta Key. 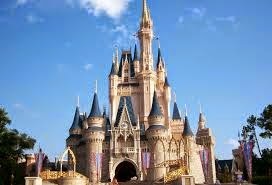 Hundreds of books have been written about visiting Disney World, Universal parks, and Florida beaches. There is obviously no way that we could possibly inform you about everything you need to know. However, this is the short, but sweet, version in its simplest form to hopefully give you a head start on your vacation planning. Honestly, what can we say that most people don’t already know? This enchanting vacation spot is without doubt one of our favorite places in the world. Sure, the one-of-a-kind rides, exhibits, atmosphere, and fun around every turn are great. But it’s something more…something not easily explainable. When you’re inside a Disney theme park, you can’t help but feel happy. The Disney music that envelops each of their four parks just sparks something inside of you. It masks your worries and brings out your childhood innocence. You instantly morph from a 60-year-old to a 10-year-old in a matter of minutes. We have been going there for 30-plus years and we’re still not tired of it. Actually, we can’t wait to go each and every time. Old favorites remind us while new attractions excite us. Between the four parks, Magic Kingdom, Hollywood Studios, Animal Kingdom, and Epcot Center, there’s plenty to keep you busy. Magic Kingdom is where it all started. We think of it as the mother ship. As you walk up and see the train station sitting high and mighty alongside the “Magic Kingdom” sign, you will feel right at home. 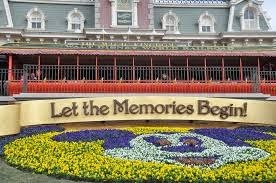 You can almost hear Mickey saying, “Come right in.” Under the train station’s tracks, the Mickey Mouse garden of flowers with the backdrop sign of “Let the Memories Begin” will be your first photo. You’ll go on lots of amazing rides, which are more like exhibits, and worth the wait in line. Our faves are: Dumbo the Flying elephant (yes, for the young and old), It’s A Small World, Little Mermaid Under the Sea, Peter Pan’s Flight, Space Mountain, Splash Mountain, Big Thunder Railroad, Buzz Lightyear’s Space Ranger Spin, Haunted Mansion, Many Adventures of Winnie the Pooh, and Pirates of the Caribbean. That’s just a partial list. Our favorite places to eat: Be Our Guest Restaurant (excellent food, awesome desserts), and Winnie the Pooh character meals at the Crystal Palace. For quick snacks, give the ginormous turkey leg a tasting. And don’t leave without trying a Mickey Ice Cream Bar. They’re the best! During the day, you can’t miss the Disney’s Festival of Fantasy Parade. At night, The Main Street Electrical Parade has become a classic… half a million shimmering lights and a superb soundtrack are the backdrops enveloping all of your favorite characters, either walking or sitting on their ‘floats.’ Kids will love seeing Mickey, Minnie, and all of the friends (and boy do they have friends). Some of the lucky kids will even have the opportunity to high five them (get a close spot, which requires early seating). The last event of the night brings you to Cinderella’s Castle for an extravaganza. This is the place to be (check on times). Watch Tinker Bell fly by, sprinkling her pixie dust over the Magic Kingdom to create her magic. First, the castle changes colors. Then you simultaneously go through a visual and musical journey of Disney’s most memorable movies in a way that you could never imagine. The grand finale is a breathtaking display of fireworks, decorating and lighting up the sky. Hollywood Studios brings us more rides and shows. These include: The Twilight Zone Tower of Terror (favorite of all), Rock ‘n’ Roller Coaster starring Aerosmith, Toy Story Midway Mania (challenge each other as you shoot at targets), Indiana Jones Stunt Show, The Legend of Captain Jack Sparrow, Beauty and the Beast Stage Show (a mini Broadway show), and American Idol Experience (audition just like in the real show). Restaurants we love: the Hollywood Brown Derby and Mama Melrose. For a quick bite, Pizza Planet has some great pizza. It’s also an arcade so if you need to take a break, the kids can have fun while you’re resting your feet. And, if you’re still longing for something delicious yet sweet, go to Hollywood Scoop for great ice cream, or pick up a mouth-watering chocolate-covered apple (mmmmm). The not-to-be-missed (our favorite show at Disney) Fantasmic! show thrills us every time we visit. Actually, if you buy the Fantasmic! Dinner Package, you get a reserved VIP spot at the show. Definitely worth pre-ordering! Mickey’s imagination (as the Sorcerer) is the premise of the show, as he envisions Fantasmic! It’s stunning and features all of your favorite Disney characters (again), paired with an unbelievable musical show, all staged on an ‘island.’ The finale aboard the Steamboat Willie River Boat is a blast. At Animal Kingdom you won’t want to miss: Wildlife Express Chain, Tree of Life (the centerpiece of Animal Kingdom and a great places for photos), The Lion King (another extraordinary mini ‘Broadway’ show), Affection Station, Kilimanjaro Safaris, It’s Tough to Be a Bug, Kali River Rapids, DINOSAUR, and our favorite there, Expedition Everest. Tusker House Restaurant, Flame Tree BBQ (excellent sandwiches! ), the Restaurantasaurus character buffet, and Rainforest Café are all choices you can’t go wrong with for a quick bite or sit-down meal. The last of the theme parks, Epcot, has more thrills and fun. Rides/exhibits not to miss: Soarin’ (soar all over California), Test Track (what a thrill), Spaceship Earth, Captain EO, Ellen’s Energy Adventure, The Circle of Life, Journey into Imagination, MISSION: Space, and The Seas. Great food: LeCellier Steakhouse, Coral Reef Restaurant, San Angel Restaurant, Tutto Italia. All unique with an authentic experience. This is just the tip of the iceberg there but it’s a start. The evening show is called Illuminations: Reflections of Earth. It takes place at the World Showcase Lagoon, begins with flames and fireworks erupting from the lagoon, and just keeps getting better. Lights blaze on the shimmering waters, and then the show turns into an adventurous tale of the history of earth, ending with an explosion of lights and sounds. If you need a break from the walking and the heat, visit one of Disney’s water parks. Our favorites are: Typhoon Lagoon or Blizzard Beach, both very different experiences. We like them both for different reasons so give them both a try if you have the time. For more great restaurants and shops, there’s Downtown Disney. Wolfgang Puck’s restaurants, T-REX restaurant, and House of Blues are good meal choices. As far as the shops go, they are all adorable, with plenty of selections of gifts for yourselves or others! At night, there are plenty of clubs to keep the young adults entertained. Each club has a different theme and all provide a tremendous amount of fun. 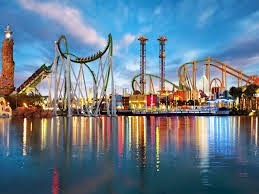 Their two theme parks are spectacular, and magical as well. They are much different from Disney, but just as wonderful. Share unforgettable experiences, actions and thrills with your family and friends. 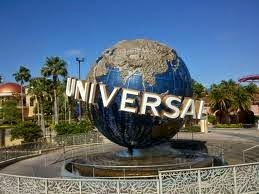 Start off with Universal Studios as you go behind the scenes and right in the middle of the action from your favorites movies and TV shows. 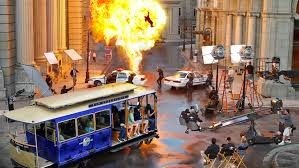 This real, working film and TV production facility combines an array of state-of-the-art rides, entertaining shows, real movie sets and other top-drawer attractions. You’ll also enjoy themed dining and shopping, a variety of exciting special events throughout the year, and you might even catch a real film crew at work on the back lot. Be sure to explore these thrilling rides/shows: Shrek 4D, Terminator Show, Despicable Me Minion Mayhem, E.T. Adventure, Disaster, Twister, Revenge of the Mummy, Hollywood Rip Ride Rockit, Transformers The Ride 3D, Men in Black Alien Attack (play a real-life videogame against your family and friends), The Simpsons, Blues Brothers Show (lots of fun), and Animal Actors on Location. Restaurant choices we recommend: Mel’s Drive-In (for a quick bite) or Lombard’s Seafood Grill (for a good sit-down meal). You can’t go wrong with any of their hotels, we love them all. Each have pools with different themes, and they’re a blast. Portofino Bay brings you to Italy, without the pricy plane ticket and knowledge of the language. The surroundings and décor are authentic and it’s nice because it’s a little out of the way of the parks… very peaceful. Staying at the Royal Pacific Resort will bring you right to Hawaii (well, that’s what you’ll feel like, anyway). Hawaiian music plays against the islandy atmosphere. Hard Rock Hotel is fun for the younger crowd, with a huge focus on music, even when you’re underwater in their pools. Water taxis simply transport you back and forth to the parks right from CityWalk. Restaurants in these hotels include: Mama Della’s Ristorante…one of our favorite Italian restaurants in Orlando, not just because of the food, but the whole experience is a blast. Mama comes right to your table, and violinists serenade you. Jake’s restaurant is another one of our favorites and one reason being their wings. They are the most delicious wings we have ever eaten… anywhere! The perfect blend of sweet and spicy leaves our mouths watering for them before they even enter our mouths. All of their food is excellent. The Kitchen has awesome burgers, and lots of other great selections as well. Universal’s CityWalk is the place to be in the evening hours. Entertainment is around every bend. Delicious restaurant selections include: Emeril’s Restaurant, Jimmy Buffet’s Margaritaville, The Bubba Gump Shrimp Company, Hard Rock Cafe, and NBA City. All are very different, each with great themes. After your palette has been satisfied, you will want to check out CityWalk’s lively action. Visit their delightful variety of shops, including Fossil, Fresh Produce, Element, and The Island Clothing Company, just a small sampling of what is there. We always enjoy visiting Sarasota and Siesta Key after a week of thrills and excitement in Orlando at Universal and Disney. It’s a great place to kick back, relax, and enjoy the sunshine, food, and beaches that are up for grabs. 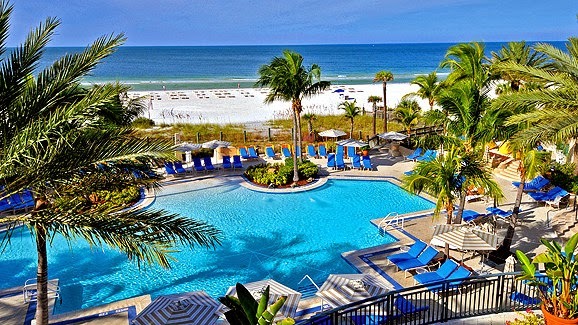 The Ritz-Carlton in Sarasota is exceptional. First class all the way. Meticulous grounds welcome you, and then introduce you to magnificent rooms that are spacious, elegant and immaculate. The bathroom was loaded with thick, fluffy towels, and lovely lotions and shampoos. Some appreciated extras include a coffeemaker and coffee, water bottles, and a small refrigerator. The staff is so helpful and friendly… the doorman, front desk, concierge and entire staff. The spa is wonderful, and offers many delicious treatments. One of the nicest things about this hotel is that if they know it’s your anniversary or birthday, they’ll adorn you with chocolate-covered strawberries, champagne, or other goodies. They really make you feel special. Now, we have to talk about the Ritz-Carlton’s private Ritz Beach Club on Lido Key. In one word… phenomenal. This is worth the price of the room all by itself. A shuttle bus takes you from the hotel right to the Beach Club, passing through St. Armands Circle (which we’ll get to later). The staff at the clubhouse treats you like royalty, so attentive and polite. Your first stop will be the charming dressing rooms. Then you will walk down the elegant stairway (as you are admiring the Gulf of Mexico) to get to the pool area. There are two pools and a Jacuzzi with comfy seating for everyone, and exceptional poolside service. There’s an adorable Tiki Bar on the beach, turquoise blue water, silky, white sand, and a backdrop of picturesque blue skies and palm trees. All for you. After reaching your daily quota for tanning and relaxing, you can head back upstairs to the dressing rooms and take showers (every amenity you could desire is there for you). When you’re all refreshed, hop back on the bus to the Ritz-Carlton, and get ready for a great evening out at St. Armands Circle. As you head on over the bridge to St. Armands Circle (shopper’s heaven), you will salivate at the magnificent, waterfront homes. Take it all in on this scenic, breathtaking drive. The finale is St. Armand’s Circle... the perfect place to ‘shop your heart out’ and enjoy varied dining experiences. Stroll around, relax, and enjoy the atmosphere as you browse through dozens of reasonably-priced, adorable shops and some upscale, one-of-a-kind boutiques. Galleries, salons, gift and specialty shops, jewelers, clothing and shoe stores are splashed around the huge circle that is a centerpiece for this quaint town. There are plenty of excellent choices for lunch or dinner as well. Some of our favorites include: Blue Dolphin Café, Crab & Fin, Lynches Pub & Grub, Ristorante Le Colonne, Terrace on the Circle, and La Malinche Mexican Restaurant. Don’t forget to stop and Ben & Jerry’s or Kilwin’s Chocolates for some delightful desserts. Armands Circle is a great find and one you’ll be sure to have on your checklist for all future visits to Sarasota. 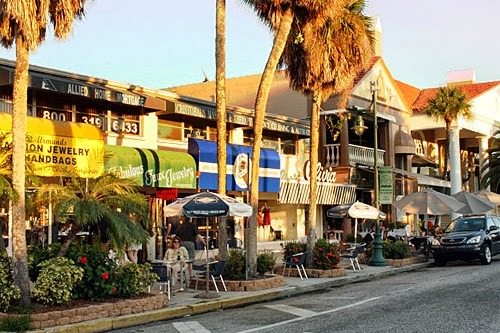 Siesta Key is one of our favorite beach towns. 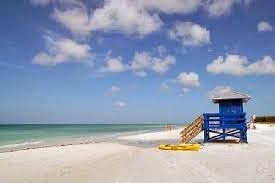 Coincidentally, Siesta Beach was voted (by coastal experts) the number one beach in the United States and was in the top 25 of the world’s best beaches. Siesta Beach is a barrier island on the southwestern coast of Florida on the Gulf of Mexico. It has unimaginable fine, white, fluffy sand… the best you will ever set your feet on. You will become obsessed while walking on it. Coupling that with clean, clear and just beautiful turquoise blue water makes this paradise. The water is calm and serene most days with minimal waves (great for kids) and so inviting… you won’t waste one minute running into it. Beachcombers, sun worshippers, joggers, volleyball players, and Frisbee throwers are scattered about, all with smiles on their faces. You will find snacks bars right at the beach, or you can cross the street in to town for some great restaurants. There are showers and bathrooms, grills, and picnic tables. We love the fact that it’s a non-smoking beach! Kudos! The weather is usually perfect and, to us, the experience here is just as wonderful as being in a place like Aruba, without the extra airfare and flying time. To be honest, you wouldn’t be able to tell the difference between the two places if you were dropped off with no knowledge of where you were. Palm trees, white sand, turquoise waters, right in the United States. Can’t ask for better than that. Mountain Creek, Vernon Valley, New Jersey. 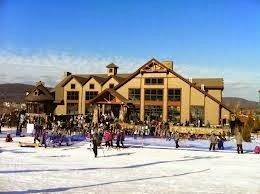 Mountain Creek in Vernon Valley, New Jersey, is the place to go if you want a fantastic family winter getaway in the NJ/NY/PA area. It's just a short drive away, but you'll feel like you're a million miles away. It's the perfect mini-vacation! I was expecting Mountain Creek, and its surrounding hotels, to be great, from what I had heard. However, I wasn't expecting to be blown away. The quality of their properties, the variety of activities, the food at their restaurants, and the friendliness of their staff, no matter where I went, was above and beyond anything I ever expected. Skiing, snowboarding, and tubing are just one part of the fun. Other outdoor adventures, and an abundance of indoor activities, will make sure you're never short of things to do. The thing is, you will probably not have enough time to do it all, but that's what future trips are for! Red Tail Lodge is the perfect meeting place to begin your day. Getting your passes and equipment are simple. Just choose your plan, and there are many to choose from, grab your gear and enjoy the trails! 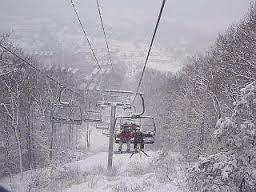 There are different options for lift tickets, and for packages with rental equipment and/or lessons. They also have a few newer additions... The 'Alpine Mountain Coaster" is the newest ride of its kind in the tri-state area! The Alpine Mountain Coaster is a cross between an alpine slide and a twisting rollercoaster. Ride alone or with a friend in their 2 seater coaster cars. You control your speed, with a unique hand-braking system as you twist, turn and dip through the trees and through the Waterpark rides back to the bottom of the mountain. There's also the 'Soaring Eagle.' This new family-friendly attraction lets you experience the sensation of flying, while soaring down the mountainside on a suspended cable. You can even share the fun with a friend on the comfortable side by side seats. 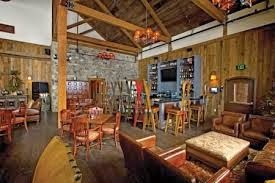 Later on, at the Red Tail Lodge, enjoy lunch together with your group, rest and warm up around the fire pits, and end your evening relaxing in the restaurant after a long day of skiing and snowboarding. If you don't feel like driving there every day, just hop on one of the shuttles. They come as often as they're needed. It makes the entire process effortless. The employees are so hospitable and friendly. You really feel that they care about you, and that they want you to have the best stay possible. The suites are magnificent. As beautiful and immaculate as the best model homes. Brown and neutral tones work alongside granite counter tops, stainless steel appliances, super comfortable furniture, and a gas fireplace. The kitchen adds so much convenience, and you can save a bundle. Just bring your favorite breakfast foods and cook them up in the morning before a long day outdoors. When you return, have a few snacks, and a couple of drinks, before you head out to a fantastic dinner at one of their restaurants. The beds are heavenly.. Temperpedic mattresses will envelop you and give you one of the best night's sleep you've had in a long time. There is a washer and dryer so you can go home without the burden of having to do laundry. They also come in handy for drying snow-covered, wet clothing. Last, but not least, is the incredible bathroom. I'd love to just pick it up and put it right in my home. The vanity/sink looks like it's an antique. The floors are heated, yes heated, and the showers are invigorating. We could just grab our wardrobes and live there forever. Nothing else is needed. There's a wonderful little patio outside the living room with a fantastic view of the mountains. The lodge itself is spectacular with views on both sides which are to die for. Springs Bistro - Italian Restaurant. Loved this restaurant. The food was so delicious and there was a great variety to choose from. The hostess and waitress were so attentive, subtly making sure we were okay. From the appetizers, salads, and entrees to the desserts, everything was prepared perfectly. Some of the delights we tasted were: Calamari Fritti, Frutti di Mare Affumicati (a lightly smoked seafood cocktail), Risotto al Frutti di Mare (Butter Poached Maine Lobster and Seared Sea Scallops), Homemade Meatballs with Fresh Pasta, and Fire Roasted NY Strip Sirloin. Dessert couldn't have been any better... Tiramisu, Chocolate Mousse with fresh Strawberries, and Homemade Cannolis. First of all, before you enter the glass dome that leads to the pool, there's a great cafe that has light snacks throughout the day. 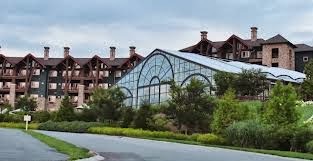 As you enter the glass dome building for some relaxing by and in the pool, you can't help but fall in love with the view... snow-covered mountains that surround the hotel. While in the pool, just go through the plastic drapes and you're in a hot tub outside, where the brisk, fresh air, combined with the warm/hot water envelop you into a state of.. fabulousness! It's totally invigorating! Inside, there's a water slide that provides great fun for the kids, along with a few grottos and caves. There are even movies by the pool every night. Don't forget to check out the sauna and steam room as well. Love it!!! It's the perfect break after a long day of skiing. In a nutshell... heaven for your body, and your mind. Let the magic begin as the Reflections Spa staff takes you under their wings. Massages, facials, and wraps will make you feel like the star you know you are. You will enjoy every minute of it, and you'll feel relaxed for the rest of the day, at least! Some of the small, but meaningful, extras that you will receive at Grand Cascades Resort are marshmallow toastings by the fire every night, free hot chocolate round the clock, free Wifi, and lots of great activities for the kids. There are also things for adults to do... we loved the hike through the mountains. At Minerals Resort and Spa, kids and adults alike will be thrilled with their spectacular basketball courts (glass walls surround them), their sports club with the best equipment, running track, additional pools, another fantastic spa, and so much more. We can't wait to check out their facilities during the summer months. Many more activities to do, including a super pumped-up water park! More to come on that later! So what are you waiting for. Pick up the phone, make a reservations, pack your bags, and have a blast at Mountain Creek resorts. Experience the new Revel. Luxury and style await around every corner of this new property. This hotel is on a different level, from physical, technological, and its prices. Feel the energy and endless excitement of their restaurants, indoor/outdoor pool, casino, shops and nightclubs. It’s the perfect place for your vacation destination. And the kids will love it, too. The skyline of Atlantic City will be forever changed with the opening of the Revel. It ascends with shimmering stories into the sky. The Revel dominates the northern end of the boardwalk. You will sea and sky from just about anywhere... from the two-acre outdoor Skygarden, the pool, in one of their 1,900 ocean-view rooms, or just by sitting at the bar. Once you step inside the elegant Grand Lobby, let your imagination run wild as you begin your journey. 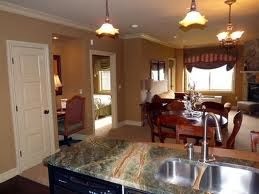 Their rooms are gorgeous. It's not just a casino that has rooms, it's a full-blown resort. The swimming pool is the perfect spot to go for a dip or take in some sun. There's the Ovation theater where you will find some of the best artists, from years passed or current, playing their hearts out. There's Exhale, their well-being spa with salt grotto and a heated mineral pool. Take surfing lessons, take yoga on the beach, shop, dance, swim, play some slots or blackjack, and then have the best night's sleep to refresh yourself. The interior design is above and beyond what you would expect, even if you are expecting the best. The City Way lobby features towering walls covered with thousands of red textile roses. There's a massive sculptural chrome tree and abstract sculptures splashed about. Feel comfy sitting on their cushy armchairs and couches that are scattered about. There's free Wi-Fi everywhere so don't worry about losing service and not staying in touch. And you won't have a worry in the world if you are against cigarette smoke...there won't be any as the casino is completely smoke-free. Dine in style in one of their 14 restaurants. Whatever you are craving, be it gourmet food, casual fare or the perfect martini, Revel has something to satisfy everyone. 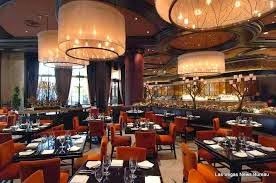 Award-winning chefs and restauranteers own their spaces and are invested in the Revel's success. Iron Chefs, Michelin chefs and James Beard Award winners from New York, Philadelphia and Washington, DC, are all here. All of the food is out of this world, we can assure you. Boasting a great selection of restaurants and bars, complete with stunning ocean views, you’re in for a treat when you dine at Revel. And did we happen to mention that there is a fabulous new casino that can help you elevate your game? There’s never been a better time to play, with your favorite slot machines and even more table games in the already lively casino. As a member, reap all the rewards...free slot play, invitations to special events and tournaments and lots of comps and cashback. It’s a great way to play. Even if you don't love Atlantic City, coming to the Revel is worth the trip in so many other ways. A great, little escape. Come and play...no matter what it is that your heart desires. If you’re looking for the complete package in a casino resort, welcome to the Revel. It’s nothing like you’ve ever seen before in Atlantic City.